Gallstones are hard deposits that can sometimes form inside the gallbladder. The gallbladder is a small, pear-shaped organ just under your liver. It stores bile, the digestive fluid that is made by the liver. Sometimes the bile becomes solid and forms stones. Some are as small as a grain of sand. Others can be the size of a golf ball. pain in your upper back. In addition, your skin may turn a yellowish color, known as jaundice. 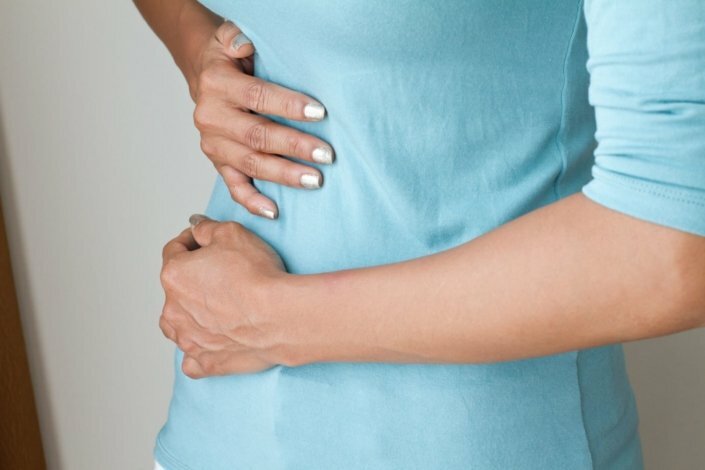 Gallbladder attacks tend to happen after heavy meals. They are more likely to happen in the evening or during the night. They stop when the gallstones move and are no longer lodged in the duct. If the duct remains blocked for more than a few hours, complications can occur. Call your doctor right away if you’re experiencing a gall bladder attack that lasts more than several hours. Gallstones are causes by imbalances in the substances that make up bile. Most gallstones (80%) are be made of cholesterol. Normally, acids in the bile break down cholesterol. But a high-fat diet can lead the liver to produce extra cholesterol that the acids can’t break down. This leads the excess cholesterol to solidify. Other gallstones are made of bilirubin. Bilirubin is a yellowish pigment in bile that is produced when red blood cells break down. These stones are formed when there is too much bilirubin in the bile. Gallstones may also form if the gallbladder doesn’t empty itself completely. are on a low-calorie diet and have recently lost weight very quickly. Gallstones can be hard to diagnose because they share symptoms with other conditions. Your doctor will do a physical exam to look for signs of gallstones. This will include looking for yellowing of the skin and tenderness in the abdomen. He or she may order blood tests. They may also order imaging tests. These could include an ultrasound or CT scan, which will make pictures of your gallbladder and bile ducts. If your doctor thinks you have a gallstone stuck in a bile duct, they could order more advanced tests to look at it. Can gallstones be prevented or avoided? In most cases, gallstones cannot be prevented or avoided. Eating a healthy diet and maintaining a healthy weight but avoiding rapid weight loss could reduce your risk. Your treatment depends on the severity of your symptoms and what the doctor finds out from the tests. No treatment. If the gallstones are floating free and you have no pain, you won’t need treatment. Wait and see. If you have one gallbladder attack, your doctor may want to take a wait-and-see approach. The problem may solve itself. Then if you have more attacks, he or she may recommend surgery. Surgery. Once you have one gallbladder attack, the chance of having another one is high (up to 70%). Many doctors will suggest surgery to remove your gallbladder to prevent a future attack. If your gallbladder is irritated or inflamed, most doctors will want to take it out right away. The surgery is most often done with laparoscopic surgery. This means that small tools are inserted into small incisions to remove the gallbladder. The surgery is safe and effective. It limits your hospital stay to about 1 day. Without surgery, the gallbladder can get infected. It might even burst open, causing further problems. Sound wave therapy. This can break up the stones so they can move into the intestine without problem. But not everyone can receive this treatment. If you have more than 1 gallstone, if your gallstone is large, or if you have other medical conditions, you may not be able to receive sound wave therapy. Medicine. You might also take a pill to dissolve the stones. This pill does not work for all people and can be very expensive. It can take 2 years or longer to work, and gallstones could return after you are finished with treatment. Surgery is still the best way to cure gallstones. Talk with your doctor about what is right for you. If your gallstones aren’t causing symptoms, you may live the rest of your life without any problems. If you do experience symptoms, your doctor may want to remove your gallbladder. You don’t need your gallbladder to live. So when it’s removed, you won’t notice much difference. You may have diarrhea at first. Some people may find they need to eat a lower-fat diet. Are there lifestyle changes I can make to prevent gallstones? Am I at risk of having another gallstone? What should I do if I have a gallbladder attack? Will I need surgery to remove my gallbladder? Are there other options?